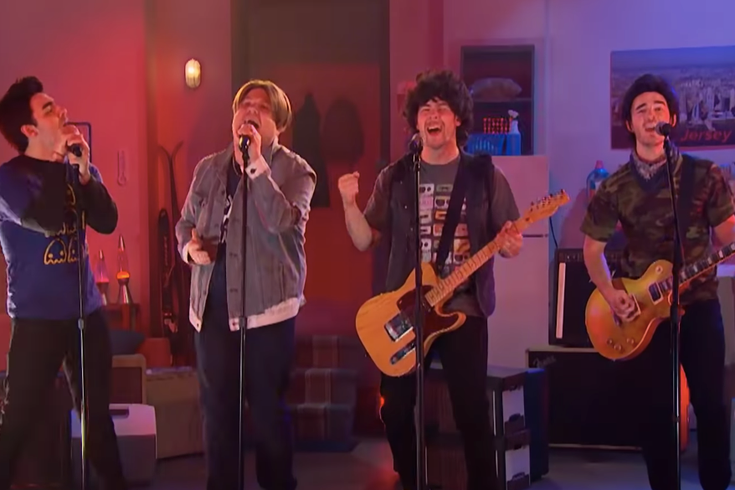 The Jonas Brothers parodied their early 2000s song "Year 3000" on "The Late Late Show with James Corden." The Jonas Brothers released the single "Sucker" last week when the band announced it would reunite after a six-year hiatus. The single is good by some standards, but the press tour has been even better. Nick, Kevin, and Joe Jonas started a week-long stint at "The Late Late Show with James Corden" with a lot of goofy content, the most probably being a parody of their 2006 hit "Year 3000." Corden joined the trio to sing "Year 2019," which, like the original song tells the tale of a person (in the parody, Corden) who invented a time machine and just returned from the future. But in this version, instead of traveling to the year 3000, it's 2019 — a year with Trump as president, more varieties of milk than anyone asked for, and the rise of the Philadelphia Flyers' mascot Gritty. The set looked just like the "Year 3000" music video and the Jonas boys tried their best to look like they were teenagers again. He said I've been to the year 2019./ You won't believe who the new president is. / It's the guy who hosts The Apprentice./ It's pretty weird, super weird./ He showed us the future through the portal and we saw everything. Spiderman, and another one and another one./ Found out there's a mascot called Gritty and he made us terrified. Perhaps it's fitting that Gritty was mentioned as one of the most terrifying parts of 2019. And that's how we like it.